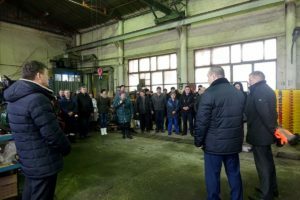 The South Ural manufacturers of self-propelled machinery discussed the deplorable consequences of the utilization charge. On April 13, a press conference was held in AiF-Chelyabinsk, dedicated to the introduction of the utilization fee and its consequences. Evgeny Vladimirovich Subachev, General Director of LLC “Plant Spetsagregat”. INTRODUCING YOUR ATTENTION TO THE REDUCED VERSION OF THE EVENT PROGRAM. IN FEBRUARY 2016, THE GOVERNMENT OF THE RUSSIAN FEDERATION INTRODUCED A NEW UTILIZATION COLLECTION TO SELF-PROPELLED EQUIPMENT (EXCAVATORS, BULLDOZERS, MOTOR GRADERS, LOADERS, CRANES, TRAILERS, QUADROCYCLES, COMBINES AND DR.). WHAT HAPPENED FOR ITS EFFECTS FOR OUR REGION? Mitelman SA: With FZ-392, which was adopted on December 29, 2015, the situation turned out that it is called “according to Chernomyrdin”: they wanted as best – it turned out as always. Unfortunately, in our country this happens very often. In general, the idea of ​​recycling collection is quite good in itself, as it allows preferences for domestic producers. Utilization fee is introduced for domestic producers, as well as for imports and for old used equipment. But for domestic manufacturers of self-propelled vehicles, the law also provides for compensation for the production of each unit of equipment. This is done with a view to avoiding WTO sanctions, which do not allow discriminating imports. But, firstly, today, machine building is not in the best situation, and secondly, in the past year, in spite of everything, about 25% of imports were imported. And 90% of the imported equipment is produced in the same parameters as in Russia. That is, such a technique could be produced by Russian plants that are under-loaded today. Most likely, there are also corruption factors, otherwise why buy Western equipment that can be produced in Russia? .. So, going back to compensation, the mechanism of them is not fully worked out, it is blurred. But the factories that produce equipment are already obliged to pay and pay a recycling fee, and its size is approximately 15% of the cost of equipment! That is, at least 15% today, technology has become more expensive. This brought chaos to the pricing process: on the one hand, customers are outraged by price increases (after all, the collection is allegedly compensated by the state! ), On the other hand, manufacturers can not raise the price, because they first need to pay a fee, and then get a vehicle passport (PTS) . And this is such a bacchanalia in the market. A number of enterprises appealed to the “Russian Support” and the ONF with a complaint against the actions of the Ministry of Industry and Trade. As far as we know, the head of the department of Naumov, who was engaged in the preparation of these documents, was dismissed from his job. But this did not change the situation. I have calculations confirming that even if the compensation mechanism is introduced, only 65-60% of the costs for the recycling fee will be compensated. It turns out that the state imposed an additional tax of 5% on turnover for businesses that today barely survive! Today, from the manufacturers of trailed and self-propelled machinery, from the Union of Industrialists and the Legislative Assembly of the Chelyabinsk region, an appeal is being prepared to suspend the operation of this law before the mechanism for payment of compensation has been worked out. WHAT MAY THEY SAY THE MANUFACTURERS? HOW DO YOU HAVE ANCIENT ASSIGNMENT? HOW DO YOU SAY IN THE IMPORT DYNAMICS? CAN IT HAVE TO COME TO STOP PRODUCTION OR REDUCE SALES? AND WHAT OTHER MEASURES, AT YOUR LOOK, MAY BE SAVING SITUATION? Smirnov IG: Our plant has been in existence for 13 years, we produce dump trucks of different carrying capacity, pipelines, timber trucks, machines for the gas and oil industry, etc. Recently began to make semitrailers. The decision with new coefficients has horrified us. Take, for example, our trailer cost from 550 to 700 thousand rubles. The base rate of the recycling fee is 150 thousand, multiplied by a factor of 2.7 – it turns out 450 thousand rubles. That is, to compensate for the collection fee, we must raise the price of the trailer almost twice! Many manufacturers, anticipating future problems, pre-recorded PTSok and now release their equipment, giving it out for the product produced in 2015. Those who do not have these PTSok, stopped their production, because for such a lot of money the buyer does not take the technique. We also stocked PTS, but the reserves are already running low. What to do next? In early March, an order was issued by the Ministry of Industry and Trade, where the mechanism was written, how to become the largest producer. Due to the inclusion of the largest producers in the register, it is possible to receive a deferred payment of the collection fee – about 90 days. Have applied for inclusion in this register – we are waiting. Bugaev. GV: Our factory produces the entire line of semi-trailers. And we are faced with all the same problems. The most important question is one: what about compensation? If we do not solve the problem with an opaque recovery mechanism now, then all producers will have to raise prices by 400-500 thousand rubles. Some manufacturers, in order to somehow compensate for the costs of the recycling fee, are starting to raise prices slowly. Not yet at 400-500, but only on average by 200 thousand rubles. But this is only the beginning. Today we are making efforts to fully switch to our production. But the design decisions and tests need a lot of time. To completely go to your walker, it may take years. Mitelman SA: It should be taken into account that the profitability of the enterprises of the machine-building complex today is a maximum of 5-7%! But you need to index salaries, update production, invest in current repairs … All this is done from profit. What kind of business support are we talking about today ?! About 30-40 thousand people work at the machine-building plants of the region. With existing problems, the salary will be delayed, its increase will stop, people will be released from work, the receipt of taxes to the regional budget will decrease, these are serious consequences, the scale of which is difficult to accurately predict today! Kiselev V.V. : We are importers and manufacturers of tractors for personal subsidiary farms and trailers for them. And we are the only ones in Russia who produce tractors. We are the largest tax payers in the Emanzhelinsky district. Last year, they imported and assembled a thousand tractors in the region, 50 more tractors made themselves, it was a trial lot. Today in the first six months we will make two hundred more tractors of our own. We are seriously doubtful about the size of the utilization fee for agricultural tractors with a capacity of up to 30 horsepower. 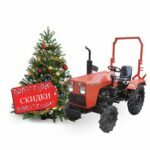 The fee is about 31% of the wholesale price of the cheapest and most popular tractor to about 10% of the most expensive cab tractor. The dollar-to-ruble exchange rate has led to an increase in the price of imported tractors in 2016 by 2013. And the additional burden in the form of a 30% surcharge on the US from the government of the Russian Federation lies at all an unbearable burden on the peasant. The size of the collection for agricultural trailers is blatant. The average retail price for such a trailer in February 2016 in the Urals is 85,000 rubles. The government introduced a salvage fee for such trailers – 330,000 rubles (or 380% of the price). In the end, we intend to abandon the release of such trailers. We also applied for inclusion in the register of the largest, but faced here with the slowness of the state apparatus: we are slow to recognize the largest manufacturers of tractors and trailers and, accordingly, the largest payers of the utilization charge. 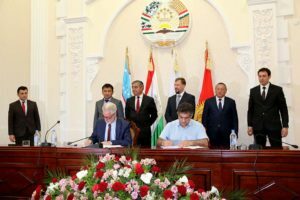 Because of this, we had to suspend sales: we are not in a position to urgently find a huge amount of money to pay the fee for the arrived tractors, so they stand without the passports of the self-propelled machine (PSM). “The rules of the game” were changed when the cars with tractors were already on their way to Russia. And in our budget payments for the collection were not planned. Recognition of us as the largest producers of tractors (and we occupy no less than 20% of the Russian market for minitractors) will allow us to delay payment of the utilization fee for up to 90 days, allow customs to issue to us the PSM before payment of the fee, will allow the sale of imported equipment and allow us to pay the fee. But will we have time to sell the tractor before we have to pay a recycling fee? It could save us: then we would pay for the recycling fee with the money of the buyer. Here is another problem: the peasants are not ready to buy our tractors at new prices. In fact, it turns out that with one hand the Government gives money to agriculture, and the other – takes the same money. I wrote a letter to President Putin asking for help to the peasantry and instructing the Government of the Russian Federation to rationally adjust the utilization rate for special equipment. Recently I received the answer: “for the purpose of objective and comprehensive consideration,” my letter was forwarded to the Ministry of Industry and Trade. The chain is closed. WHAT ARE OTHER MACHINE-BUILDING ENTERPRISES FROM THE SITUATION? WHAT THE BRANCH WAITS FOR THE NEAREST FUTURE AND WHO CAN HELP THE PROBLEM? Subachev EV:. We also submitted documents for inclusion in the register in the Ministry of Industry and Trade, but so far there is no answer. We are forced to add the size of the utilization charge to the price of the produced equipment. Customers are horrified. The coefficient for our vehicle is 4.8, multiplied by a base rate of 150 thousand rubles – we get colossal sums. It is clear that in this situation the volume of orders will fall. Just a few days ago, the customer asked who needed a paw snow loader. Hearing our price, he went to look for used equipment. It is difficult to say what will happen next. We will do everything so that our employees will not be left without work. It is not excluded that we will have to return to what we started once – we will brew beer kegs. Mitelman SA: Not only is the refund mechanism blurred, but tomorrow we can still find out that the Ministry of Industry and Trade has not put in place the necessary funds in the budget! Kalashnikov EV: I have a letter signed by the Deputy Minister of the Ministry of Industry and Trade, where the sequence of work of the utilization fee has been explained and it is clearly stated that the subsidized part is budgeted in the budget, that is, it is provided for the expense item! Although, I agree, until the subsidy tool has worked. Yes, the situation with the recycling collection was created by non-professionals, but those instruments that operate are quite working, in our opinion! (The DST-URAL plant is already on the list of the largest producers – Prim.red. ).